The Republic of Bulgaria is situated on the Balkan Peninsula in southeastern Europe. The country covers an area of 110,993.6 sq. km. The State borders of Bulgaria have a total length of 2,245 kilometers. The Northern border with Romania, which passes along the Danube, has a length of 609 kilometers. The West bank of the Black Sea forms the entire eastern border of Bulgaria with a length of 378 km. The Southern border is shared by Turkey (259 km) and Greece (493 km), the Western border with Serbia (341 km) and the Former Yugoslav Republic of Macedonia (165 km). Bulgaria is a country of mountains, rivers and hilly plains. The two main mountain ranges are called Balkan - Stara Planina and Rhodope Mountains. Mountains, which was named Balkan Peninsula, extending from northwest of the country, south of Sofia Valley in west central Bulgaria, and continues east to the Black Sea. The main river in Bulgaria is the Danube River, which passes along the Northern border. Iskar River, the longest river in Bulgaria, springs from the Rila Mountain in a Northerly direction passing through Sofia, before it joins the Danube. Maritza, the other major river, rises in the Rila Mountains in an Easterly direction, then continued South through Southeastern Bulgaria determining the boundaries between Greece and Turkey. Bulgaria's capital Sofia is a city located in the Western part of the country. It is the largest and most populated city in Bulgaria, and the political, cultural and commercial center. Plovdiv is the second largest city in Bulgaria. It is located in the center of the agricultural region in Southern Bulgaria and is a center of food industry. The third largest city of Varna is located on the Black Sea coast and is the main seaport of the country. According to the National Statistical Institute of Bulgaria, the country's population at the end of 2006 is 7,679,300. Compared with the level of the previous year, the population has decreased by 39,500, which is attributed to a negative natural population growth. Data on the population in Bulgaria has a demographic trend of decline since 1990. The proportion of the urban population in 2006 was 70.6 %. Bulgaria's history dates back to 3,000 years ago. The Bulgarian state was founded in 681 AD, when Slavs and Proto are united under the scepter of Khan Asparuh. The passage of the Bulgarians to Christianity in 865 AD joined Bulgaria to the Christian civilization. The creation of the Cyrillic alphabet in the second half of the ninth century, during an age when previously only Latin and Greek alphabets were used for writing, gives a strong impetus to the cultural development of the country. Unfortunately in 1396 Bulgaria fell under Ottoman occupation, which lasted nearly 500 years. The Liberation War (Russo-Turkish War) gave Bulgaria the independence in 1878. In 1879 the Constituent Assembly taking first Constitution of Bulgaria, which is one of the most democratic constitutions of the day. In the early twentieth century, Bulgaria was involved in the Balkan wars – the First Balkan War (1912), and the Second Balkan War (1913), with a disastrous ending. In the summer of 1915, Bulgaria entered the First World War on the side of the central forces and signed an armistice with the Franco-British force on 29 September 1918. The peace treaty with Bulgaria was signed on November 27, 1919 in Neuilly-sur-Seine. Bulgaria lost much of its territory. Between the two world wars, Bulgaria was ruled by a series of short-lived governments. After the outbreak of WWII, Boris III of Bulgaria declares neutrality. However, Bulgaria is under pressure to call its army and to participate in military operations. Of particular concern of the Bulgarian government was to protect the Jews living in Bulgaria, who as a result were rescued from the Holocaust. The first decades of the 20th century were years of economic prosperity and effort. Bulgarian goods and the Bulgarian currency, called "Golden Lev”, acquired a high value European markets. Trade relations with Austria, Germany, France and Britain have stepped up. After the Second World War the Bulgarian Communist Party became the leading political force in the country. The Soviet leadership destroyed the remnants of the old system, and imposed a one-party system in 1947. From 1954 to 1989, Todor Zhivkov, Chairman of the State Council, dominated political life, becoming the longest leader staying in power. Policy was directly linked with that of the Soviet Union, industry was nationalized and agriculture collectivized. During the socialist period in Bulgaria, lasting from the end of World War II to 1989, farmland was in general collectivized. In urban areas, private property continued throughout the socialist period, except for older buildings which have been confiscated or expropriated by the state. The Communist Party has tried to modernize the economy of Bulgaria, and has achieved some success with industrialization, due – not least – to the participation of Bulgaria in the Union Council for Mutual Economic Assistance, which gave Bulgaria a captive market of transport and IT products in Eastern Europe. But in the 1980's, as elsewhere in Eastern Europe, the economy was sluggish and the system began to disintegrate. Zhivkov resigned on November 10, 1989, the day after the fall of the Berlin Wall. Although his fall from power has been catalyzed by economic and social turmoil, it is a consequence of a unilateral decision, not a general revolution. Since 1991 Bulgaria has a democratic, unitary parliamentary republican constitution. The National Assembly consists of 240 deputies, each elected for a four-year term by popular vote. The National Assembly has the power to enact laws, approve the budget, schedule presidential elections, select and dismiss the Prime Minister and other ministers, declare war, deploy troops abroad, and ratify international treaties and agreements. The president serves as the head of state and commander-in-chief of the armed forces. He also chairs the Consultative Council for National Security. Bulgaria became a member of the United Nations in 1955, and a founding member of OSCE in 1995. As a Consultative Party to the Antarctic Treaty, the country takes part in the administration of the territories situated south of 60° south latitude. The country joined NATO on 29 March 2004 and signed the European Union Treaty of Accession on 25 April 2005. It became a full member of the European Union on 1 January 2007, and elects 17 members to the European Parliament. Bulgaria has twenty-eight administrative regions. They are subdivided into 264 municipalities. There are nearly 100 years of cadastral activities in Bulgaria. The Cadastre Act (promulgated SG No. 8 of 1908) has the primary objectives: the determination of legal and physical property, the introduction of land books, and the correct allocation of land tax. The Law on cadastre and land consolidation (promulgated SG br.127 of 1941) says that "the cadastre is the geometric representation, inclusion in a list and description of the real estates". ACT unified cadastre of the People's Republic of Bulgaria (promulgated SG br.35 / 1979), which sets clear procedures for making, notification and approval of cadastral plans, a significant deficiency that is, requiring the collection of all data the territory of the country with its natural resources, groundwater and surface material property values. Law on Cadastre and Land Registry (State Gazette, issue 34 / 2000) – under existing legislation, any transfer of ownership and other real rights over immovable property is registered in registry offices at district courts. Since 1997 these acts are performed with the assistance of private notaries. Repealed Act unified cadastre (in force in the period from 1979 to 2000). Define the responsibilities in respect of the cadastre for the whole of Bulgaria and establishes procedures for the creation, adoption and provision of cadastral information. The Act provides multipurpose cadastre of real estate, tax and infrastructure needs. However, that law sets a goal that is difficult to achieve: the collection of data on natural resources and the surface and underground facilities. Requirement for similar amounts of data and lack of regulatory measures to maintain their current status are the main reason such a cadastre can not be fully realized. Law on Cadastre and Land Registry, in force since 25 April 2000 is intended to serve as a basis for reform in the registration and transfer from personal to property registration. The Act provides for the introduction of information systems for land registers, which are designed to store, maintain and provide cadastral data and property rights. This system, as proposed multipurpose cadastre, will serve the citizens, businesses and public administrations by reducing administrative costs. The law regulated GCCA and cooperation between the Registry Agency, and the exchange of information between them, which is a necessary condition to achieve a modern, active, relevant and accurate cadastre and land registry. These records will contain data for all properties throughout the country. The cadastre is created, maintained and stored by the Agency of Geodesy, Cartography and Cadastre to the Minister of Regional Development and Public Works, which manages and controls the overall activities in connection with the cadastre. The cadastre consists of a set of basic data on the location, boundaries and dimensions of real estate in the Republic of Bulgaria recruited performance, kept up-to-date and kept down by this law. Cadastre covers data ownership of real estate, information on other real rights over immovable property; data on state boundaries, boundaries of administrative-territorial units, land borders and boundaries of areas with the same purpose and permanently available (map on that incorporate additional specialized map data). Cadastral data are entered on the cadastral map and recorded in the cadastral registers. The institution, responsible for creation and maintenance of cadastre in Bulgaria is the Geodesy Cartography and Cadastre Agency. The Agency is a juridical person, having its seat in Sofia and operating through its 28 regional units – Geodesy Cartography and Cadastre Offices, located in the administrative centers of the regions (oblast centers). The Cadastre Agency was founded in 2001 and assumes obligations in the fields of Geodesy and Cartography. In 2006 it is transformed into the Geodesy, Cartography and Cadastre Agency (GCCA). Pursuant to the new Geodesy and Cartography Act (in force since 9 April 2006), the Agency took over also the responsibilities in the fields of geodesy and cartography. The Property Register consists of lots of real estate. In the Land Registry are recorded instruments which recognize or transfer the ownership or establishing, transferring, amending or terminating other real right on real estate foreclosures and mortgages on them, and other actions, circumstances and legal facts which law provides for registration. A judge ordered the Registry entries in lots of real estate located within the respective region. Property Register is kept by the Registry Agency under the Minister of Justice. Minister of Justice exercises direction and control overall activities in connection with the Land Registry. Cadastre and Property register are linked by bilateral relationship based on the identifier of the property. Cadastre and Land registers are public. Main private bodies are notaries and licensed surveyors. Notaries in Bulgaria are private. Transactions of property ownerships can be registered in the Registry Agency only after the transaction have been approved by notary. Law on notaries and notaries activity (6 December 1996.) establish the legal status of notaries and Notary Association, Notary organization of business and notary fees. Rules for entries were approved by Decree No 1486 of the Council of Ministers (13 December 1995.). The entry is to give publicity to the declared incomes in the manner prescribed in these Rules. Entries, notes and deletion of documents are only allowed for cases that are expressly provided for by law or these Rules. Subject to entry only acts performed by notary or a notary signature. This does not affect the entry of instruments issued by the appropriate governmental authorities. When the property is located in an area with approved cadastral map, the act applies to a copy of the sketch map. Licensed surveyors are implementing the works for cadastre, respectively for geodesy or cartography, assigned to him in compliance with the normative requirements. they are carrying out activities on geodesy, cartography and cadastre – work out plans of landed properties and buildings, schemes of independent sites in buildings, projects for subdivision and amalgamation of immovable properties, combined schemes for full or partial identity of the boundaries of a landed property, a cadastral map and cadastral registers , etc. The Chamber of Graduated Surveyors has been established in 2006 to answer the increased volume of work for surveyors, and the need of equalization the activities that could be performed and the certificates issued by the European Union. It is non-government organization, which unites graduated engineers’ surveyors. Its main aim is to support, encourage, regulate and promote the interests of all its members and to increase the value of their services to the public. In its activity it will provide support for its members to continue their professional development and keeping them inform for the national and international standards in the field of surveying, cartography and photogrametry. There are some 500 members. The Chamber of Graduated Surveyors maintains a close partnership with the universities, which provide education for surveyors, and together we organize qualification courses, post graduated education as well as courses for professional qualification, where members can promote and exchange profession knowledge. As one of the main terms of reference in the future for the Chamber imposed to be informing the students of surveying for their possibilities to start their career and cooperative work for developing high-qualified experts. The Association of Geodetic Companies (AGF) was founded in 1997; to date there are 57 member companies throughout the country, with a total number of employees of over 670 engineers in geodesy. AGF members are the largest state, municipal and private companies. AGF is a member of the Union for Private Economic Enterprise (SSE) and the Bulgarian Industrial Association (BIA). The Employers Association is a structure that actively cares for the interests of its members before state institutions and agencies, and participates in the development of regulations in the field of cadastre and surveying. AGF is a reliable partner of state and municipal institutions and an active assistant to the specialized parliamentary committees in the creation of laws in the field of geodesy, cartography and cadastre. AGF cooperate with the Chamber of Engineers Surveying in Bulgaria Union of Surveyors of Serbia, to authorized surveyors Chamber of Macedonia and geodesic structures from neighboring Balkan countries. The activities in the field of cadastre, geodesy and cartography can only be performed by licensed individuals. The licensing is administered by the GCCA. There are more than 2,300 licensed surveying companies in Bulgaria and about 50 companies actually working in this field. The Agency for geodesy, cartography and cadastre assign to competent persons the implementation of activities for creating cadastral map and cadastral registers. Cadastral activities can fulfill individuals receiving qualifications in cadastre. Agency of Geodesy, Cartography and Cadastre awarded to qualified individuals carrying out of activities on the creation of cadastral map and cadastral registers. Owner or other interested person may also be a person qualified to instruct the drafting of sketches of land and buildings, diagrams of objects in separate buildings, projects for the separation and pooling of real estate, combined sketches for full or partial identity of the boundaries of the land, cadastral map and cadastral registers. Person qualified in surveying and cadastral mapping may be a natural person who is a Bulgarian citizen, has a university degree in geodesy with degree Master of Engineering, has at least two years experience in the field of cadastre, respectively, geodesy and cartography and has been convicted and Bulgarian legal entity which has the object of establishing the cadastre, respectively, carry out activities of Geodesy and Cartography, and his standing has specialized staff person or persons authorized to engage in geodesy, cartography and cadastre. An applicant applying for entry in the appropriate register at the GCCA. Capacity to engage in cadastre, geodesy and cartography is being acquired from the relevant entry in the registry. Registers of persons qualified to engage in cadastre in Surveying and Cartography are public. The registers of the persons competent to implement activities of cadastre, geodesy and cartography are public. Bulgarian education has always been of high level. The main university for cadastral surveying professionals is the University of Architecture, Civil Engineering and Geodesy (UACEG) in Sofia, the oldest and among the most prestigious higher technical schools in Bulgaria. The University is to provide training compatible with the European educational and qualification standards, accessible for candidates all over the world. The University was founded in 1942 as a Higher Technical School. In 1945 it was transformed into a State Polytechnic. In 1953 the Polytechnic was divided into several institutes one of them being the Institute of Civil Engineering. In 1977, the institute has been renamed to Higher Institute of Architecture and Civil Engineering (VIAS). In 1990 by a decision of its General Assembly the Institute was renamed University of Architecture, Civil Engineering and Geodesy (UACEG), the official accreditation being voted by the Parliament on 21 July 1995. On 15.11.2001 it received its institutional accreditation. Some figures: number of students: 3,800 (including 486 part-time students, 352 foreign students and 50 postgraduate students). Academic staff (full-time): 435 (including 74 professors, 137 associate professors, 202 teaching assistants, 22 lecturers); holding doctorate: 250; academic staff (part-time): 190; holding doctorate: 60. For the time of its existence UACEG has trained more than 5,500 architects and 25,000 engineers. The 5 faculties – Architecture, Structural Engineering, Hydrotechnics, Geodesy and Transportation Engineering, including 33 departments offer the following degree programmes: Architecture, Urbanism, Structural Engineering, Hydraulic Engineering (Hydraulic Structures, Irrigation and Drainage Engineering), Water Supply and Sewerage, Transportation Engineering and Geodesy. The duration of study, incl. the time for preparation and defense of diploma thesis is 10 semesters for the engineering programmes and 11 semesters for Architecture. Furthermore, in the Free Faculty each student or professional may pursue additional 5-semester programmes on Construction Company Management, International Economic Relations, Entrepreneurship and Law in the International Business, Computerized Information Processing, Computer-Aided Design, Translation of Specialized Literature, and Land and Property Management. The establishment and maintenance of an efficient system for cadastre and registration of ownership (and other rights in real property) is vital for the social stability and sustainable economic performance of a country. Secure tenure of land provides a sound basis for social and economic policy, basically because it creates confidence and promotes an active land market and efficient land use. Good land administration and land management are also a determinant factor for all international investments. Furthermore, geospatial base data derived from a digital real estate cadastre are an indispensable precondition for implementing spatial planning and environmentally sustainable development. Bulgaria has a modern multi-purpose real estate cadastre that meets the needs of administration and of customers. The main purpose of the cadastral system is to provide equal services to the clients in modern manner with accurate data in electronic form, time saving, as well to secure the rights of ownership of the citizens. The system is transparent for the general public in what concerns the registration of sale contracts for real estate. It was created computerized information systems for Cadastre and Land Registry that are interconnected. Services of the cadastre and land registry fees are paid in amounts determined by rates approved by the Council of Ministers. Cadastral map in Bulgaria provides a description of land throughout the country - urban, agricultural, forestry and other land, a description of buildings in the landed properties in areas where it is made and entered into force. Cadastral map in Bulgaria provides a description of land throughout the country - urban, agricultural, forestry and other land, a description of buildings in the landed properties in areas where it is made and entered into force. 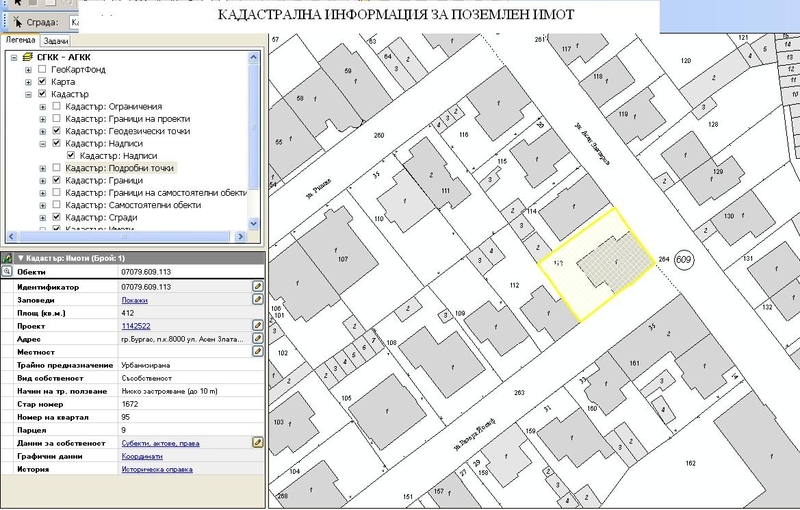 The Bulgarian Cadastre provides information about individual objects in buildings (apartments, studios, shops, etc.) and recruiting additional cadastral data property - easements, limits of security zones and other restrictions. Regarding the nature of the cadastral map and other records and books, it is necessary to bear in mind that the cadastral map and cadastral registers shall be made in writing and graphic on traditional media and in digital form on magnetic, optical or other technical data; cadastral card is supported only in digital form, the pattern of individual objects in the buildings floors are built and maintained in digital and graphic a form approved by the Executive Director of GCCA; auxiliary registers are maintained in digital form. Under existing legislation, reform of the system of cadastre and land registration should be completed by 2015 when all the data on real estate must be in digital form (cadastral map for the whole territory of Bulgaria and land registry). This reform will ensure the protection of property rights and transactions, and mortgages. cadastre is indispensable base for creation of the geographic and specialized information systems, for regional development plans etc. Cadastre objects are landed properties, buildings and objects in separate buildings. Cadastre data includes the location, boundaries and size of real estate on property rights and other property rights, as well as data on state borders and boundaries of administrative-territorial units (or limits of areas with the same permanent destination). Land registers are related to bilateral relationship based on the identifier property. Basic cadastral data is the identifier of land, the boundaries defined by geodetic coordinates, area, information on sustainable use, how to address sustainable use of land and property. They also include information about the built-up area, number of floors and use of buildings (with ID), location and destination floors of individual objects in buildings. Cadastral information is created and stored in digital, graphic and written form, and is updated only in digital form. Cadastral map (where have been created) includes the whole territories - urban, agricultural lands, forests and other areas. Each property is assigned a unique number for the country – ID. The reform in Bulgaria shift from nominative to property registration and making a bilateral link between the databases of cadastre and land register by the identifier of the property. Bulgaria established Joint information system – the basis for establishing the geographical and specialized information. This is integrated information system, includes databases of the cadastral map and cadastral register of immovable property and those of the Land Registry. Integration between cadastre and land register is unique identifier number of the property. This Identifier is a unique number, synonymously identifying an object over the whole territory of the country. It consists of 19 digits, grouped in 5 fields (UCATTU, cadastral region, property number, building number, number of self contained object in building). The system is implemented in all 28 regional offices in Surveying, Mapping and Cadastre and all 113 entries offices all over the country. The information system is designed to establish connections with other systems and registries for state and municipal property, etc. The information system provides a controlled constant and direct access to data registries and cadastral map and land register through the Internet One-Stop-Shop (OSS). The cadastral information is created, maintained and kept in digital format, graphical format and textual format. The cadastral information is entered in the cadastral map, cadastral registers and the schemes of self contained objects in buildings. The cadastral information is authentic and available to the public. It contains data about: boundaries and identifiers of landed properties; boundaries and identifiers of buildings and self contained objects in buildings – apartments, studious, shops, garages, recreation and health centers etc; owners and holders of other real rights; act/deed from which the owners benefit their right over immovable properties; the state borders, boundaries of administrative-territorial units, boundaries of territories belonging to settlements, and boundaries of territories of identical durable land use. Cadastral objects are the landed properties, buildings and self contained objects in buildings – for buildings where separate floors or parts of them belong to different owners or are possessed on the basis of different documents of ownership. Basic cadastral data are for a landed property – identifier, boundaries fixed by the geodetic co-ordinates of the points defining them, area, durable land use, land use mode, address, for buildings - identifier, built up area, number of floors, destination; for self-contained object in a building - identifier; location; floor number, use. The preparation of the cadastral map and cadastral registers shall be under the terms and conditions set out in Decree No 3 (April 28, 2005) for content creation and maintenance of the cadastral map and cadastral registers. Cadastral map and cadastral registers are created based on existing maps of the recovered property and cadastral plans of existing settlements. Data for the owners and holders of other real rights, and for most of the acts of owners who derive their rights, was collected from the records to existing maps and plans submitted by the owners of the instruments in the process of creation of the cadastral map from the municipal registers and regional registration of tax records and more. Data on ownership and other real rights shall be determined on the basis of the Office of the registry data. The cadastral map is drawn up in 1970 in the coordinate system scale 1:1,000 in urban areas and 1:5,000 for rural territories. Boundaries of landed properties are set by the designated location on site, in accordance with the document of title. Geodetic measurements apply only in cases where a register of sites not available in previous plans and maps, or when you need to be carried out control measurements to improve the accuracy of the map. The cadastral map and cadastral registers are produced by using of the existing map of restored ownership (created pursuant to the Ownership and Use of Agricultural Land Act, the Restoration of Ownership over Forests and Land in the Forestry Domain Act) and the valid cadastral plans of settlements (approved according to the routines under the repealed Unified Cadastre Act and the Territorial and Urban Development Act) to a maximum possible extent. The landed properties boundaries are established as depicted on the terrain – in correspondence with the document of ownership. The properties are individualized by their boundaries, not by their area. Data about the owners and the holders of other real rights, as well as about most of the acts/deeds, from which the owners benefit their right over immovable properties, is collected from the registers which are parts of the existing maps and plans, from the acts submitted by owners during the process of creation of the cadastral map, from the municipal and regional administration registers, from the taxation registers, etc. Data about the right of ownership and the other real rights are clarified on the basis of data, provided by the entry offices. The cadastral register of immovable properties does not contain data about owners or holders of other real rights, as well as about acts/deeds, from which they benefit their right over immovable properties if such are not found. The improvement of cadastral map accuracy will be carried out sporadically - in the process of its maintenance. When approved map data have been obtained from a plan or map in graphical format, the boundaries of landed properties and building outlines will be surveyed and coordinated at a later stage by geodetic/field surveys. The maintenance (amendment) of approved cadastral map and cadastral registers will be paid for by the owners, i.e. the state will not have to allocate financial resources for this activity anymore, and the cadastral map will be operational and kept up to date. The implementation of the new information system allows adding thematic and specialized data to the basic cadastral data, such as cartographic and geodetic data, data from satellite images etc. On the other hand the cadastral data could be combined with geographic information. The basic cadastral layer will be added with new information layers, describing various aspects of land use and ownership, spatial planning, infrastructure – below and above the earth surface, with geographic, economic and other use. The variety of cadastral, geodetic and cartographic activities performed is a constant source of up-to-date basic spatial geoinformation about the territory of the country. A high grade information system for cadastre and property registration as well as spatial geoinformation for the whole territory of the country is a precondition for development and good functioning of modern information society. Many authorities held registers of real properties – The Main Department for Geodesy, Cartography and Cadastre (until 1990) – cadastral plans of urbanized areas and geodetic and cartographic operations; The Ministry of Regional Development and public Works – cadastral plans of urbanized areas, geodesy, development plans and acts of exclusive state ownership; Municipal authorities – cadastral plans of urbanized areas and development plans and acts of municipal ownership; Regional authorities – acts of state ownership; The Ministry of Agriculture and Forestry (through the Regional and Municipal Offices) – restoration of ownership in agricultural land, forests and other territories; The Ministry of Transport and Ministry of Environment and Water – territories of transport and water etc. One and the same information was registered many times. Discrepancies in the data and fraudulent practices. In the period between 1990 and 2000 efforts in Bulgaria led to considerable progress in the process of restituting properties and guaranteeing land ownership rights. During this time, restoration of ownership for agricultural land and forests and for expropriated immovable properties in urban areas was finalized. Technical reform – development of information system for cadastre and property register, accessible through Internet for clients with different rights for access. The reform in the cadastre and property registration system has to be finalized by 2015. By that time data about all immovable properties in the country shall be updated and combined. The reform will provide guarantees to the ownership rights, secure transactions and mortgages, considerable decrease of the number of court disputes and will create conditions for fare taxation policy. Correct and accurate cadastre is a precondition for the immovable property market development and improvement of investments efficiency. Base of this GCCA updating the information system for providing more services in electronic manner and in cooperation with notaries look forward to link the information system with the system of the notaries for future e-transactions. GCCA also continue with quality improvement of the services and modernization of the administration.